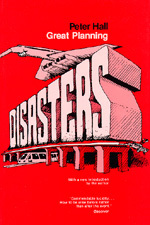 In this "pathology of planning," Peter Hall briskly recounts the histories of five great planning disasters and two near-disasters and analyzes the decisions of the professional bureaucrats, community activists, and politicians involved in the planning process. He draws on an eclectic body of theory from political science, economics, ethics, and long-range future forecasting to suggest ways to forestall such grand mistakes in the future. For this edition, Hall has added a special introduction in which he reflects further on the sequels to these cautionary tales and on the moral planners and citizens should draw from them.